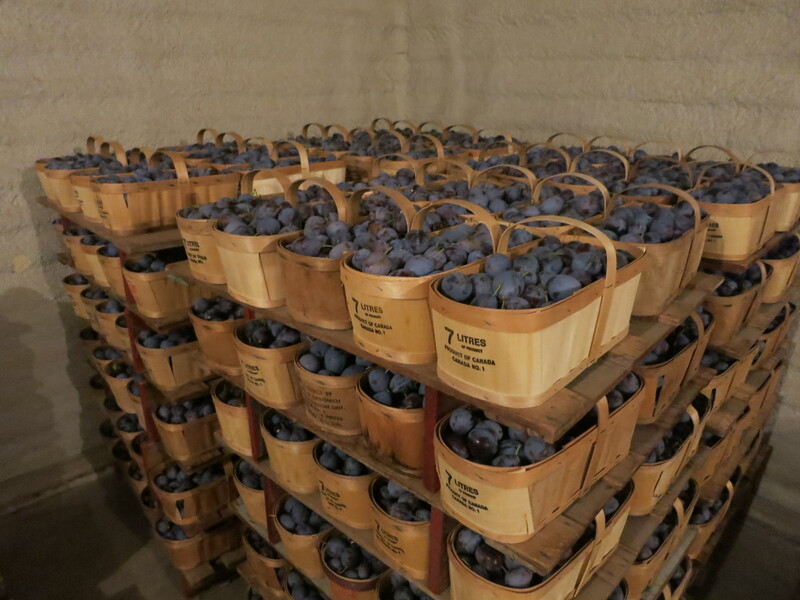 If we only grew fruit here at Thiessen Farms, our harvest would be complete. The orchards are empty. We might even be sitting with our feet up, relaxing. But since we also grow vegetables, the harvest continues … Winter squash & pumpkins are replacing peaches & tomatoes on our tables at the farmers’ markets and in the CSA boxes. 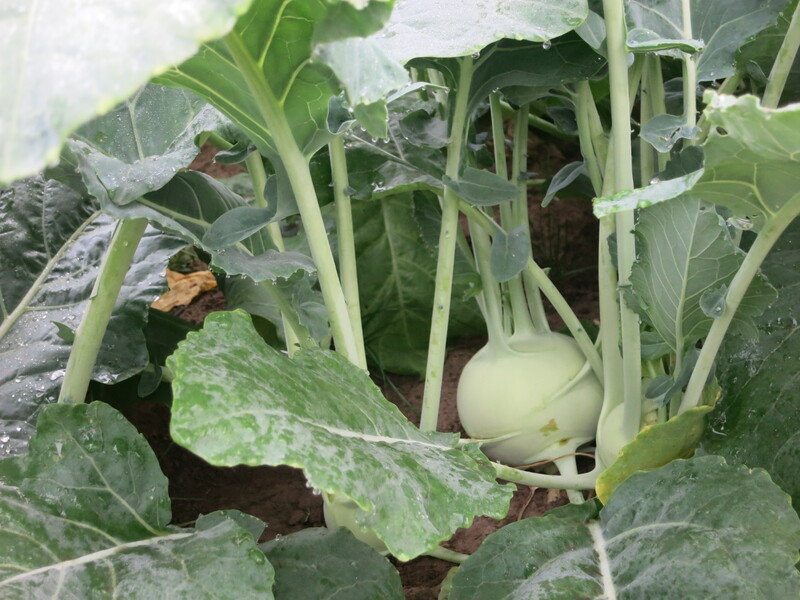 There are even new crops just beginning to produce – edamame, kohlrabi & cabbage, and if the nice fall weather lasts, maybe lettuce & Asian greens yet too. Because the rabbits ate most of the edamame, there isn’t much of a crop this season – just a bit for the markets, not enough for CSA. While we are weary from the long season, the vegetables are doing great! In fact, they don’t want to stop growing. Many of the crops we finished harvesting earlier, and mowed down, or even disced under are coming back – new life at the end of the growing season. It’s exciting to see! 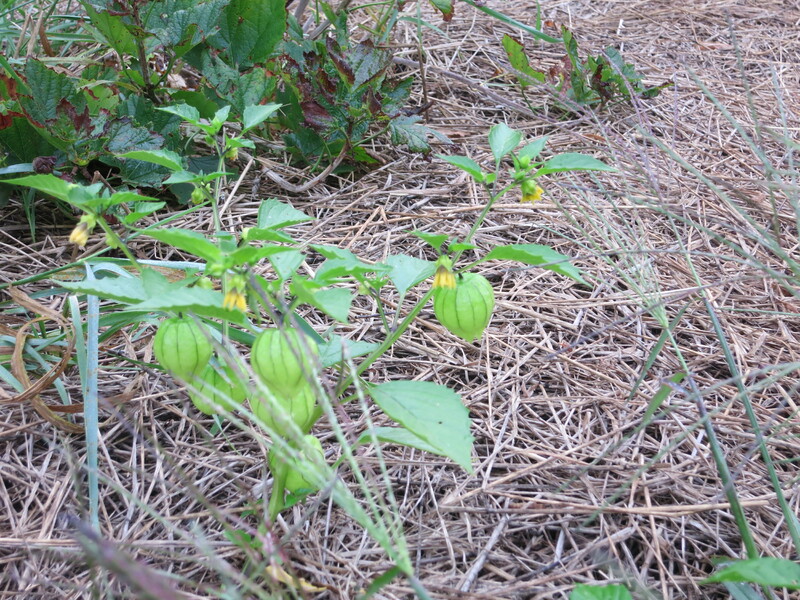 Tomatillo plants growing & producing fruit where we had them last year. 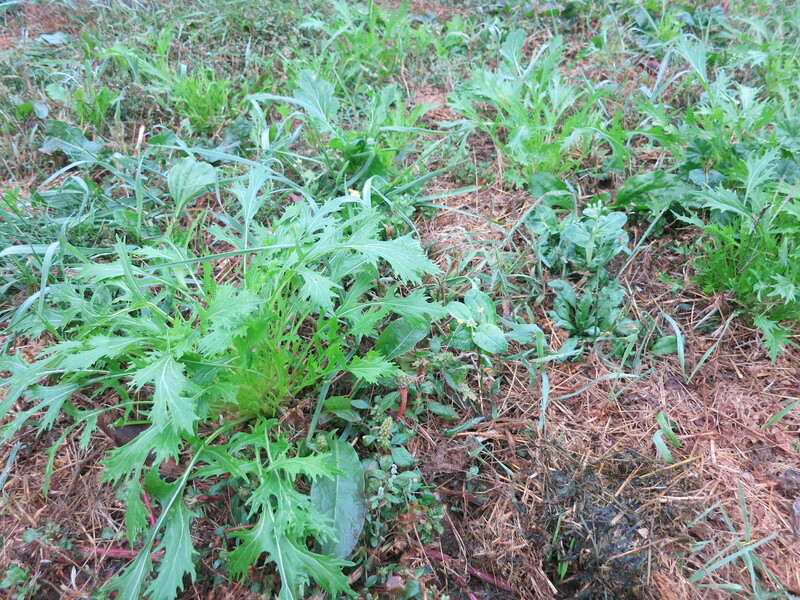 Asian greens from May, growing after being mowed down & the ground disced. 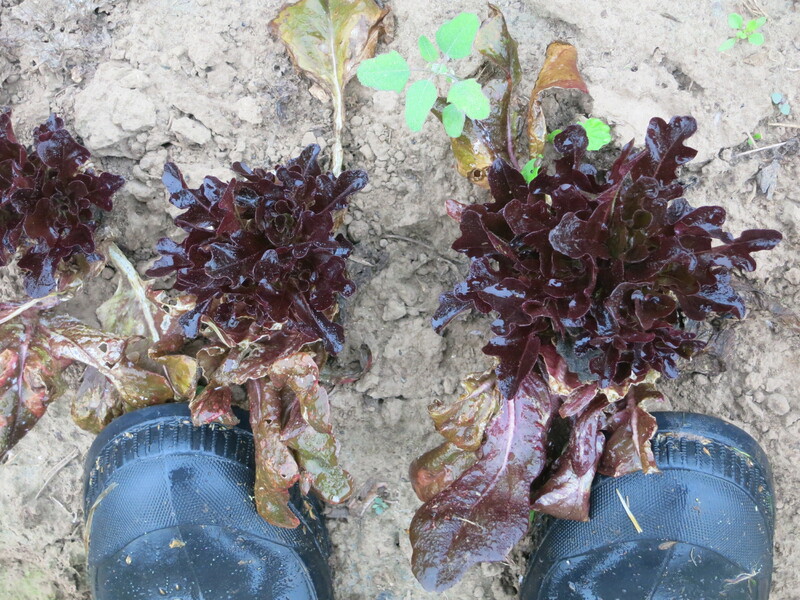 Lettuce coming back for another round after being cut at ground level. 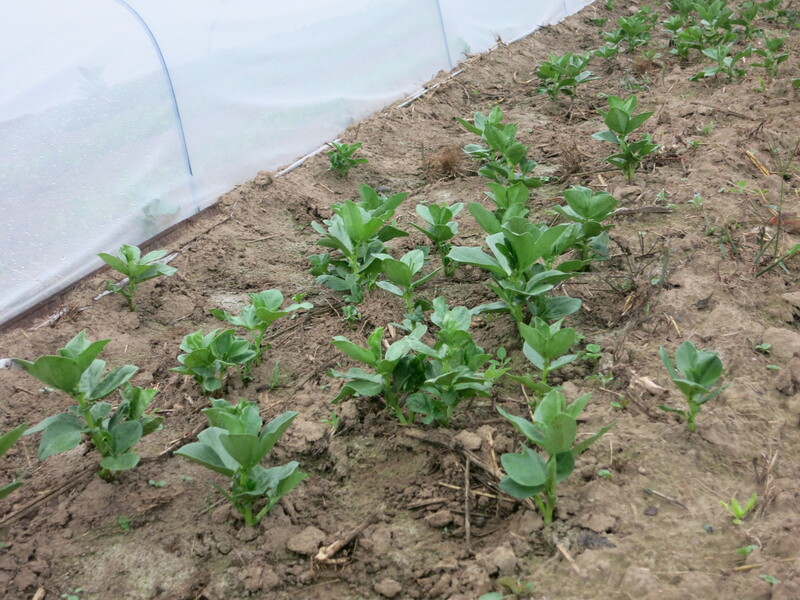 The fava beans have reseeded themselves. 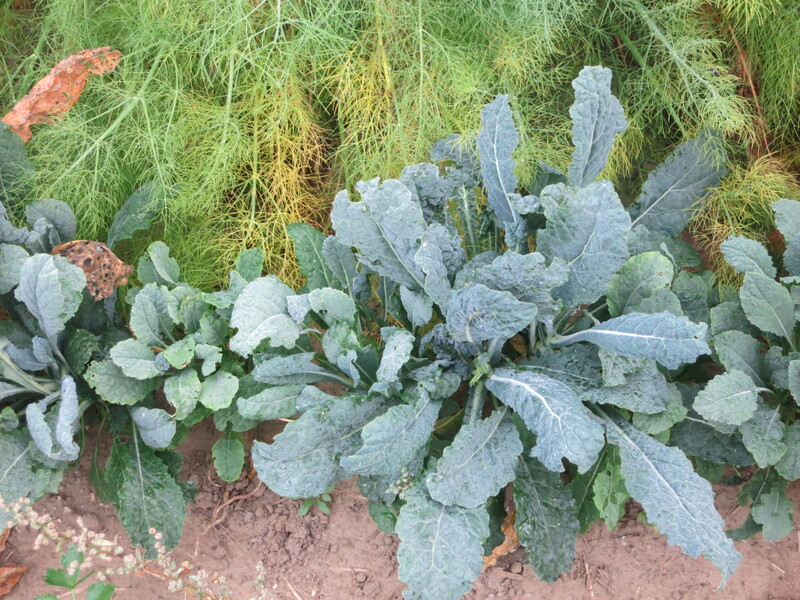 This is kale growing where we had it about 5 years ago. 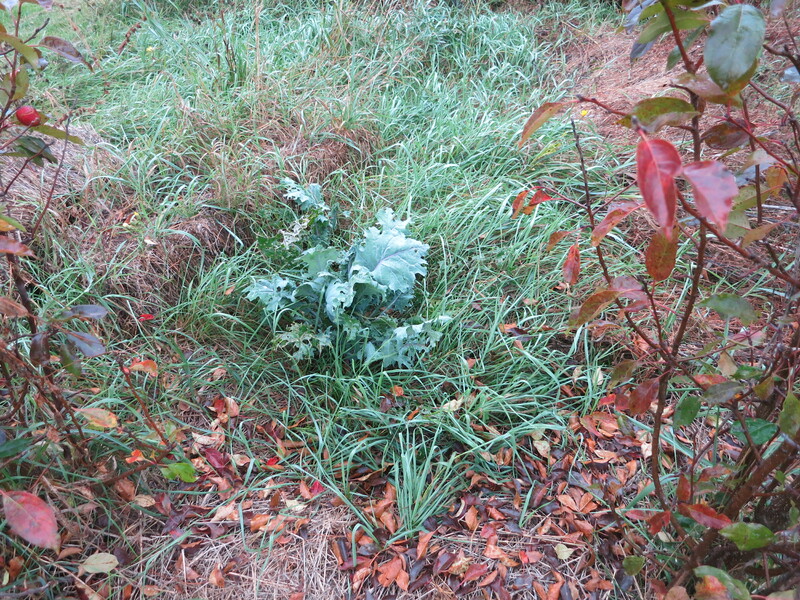 The spot has been planted to trees now, but still a few hardy kale plants come back each year. 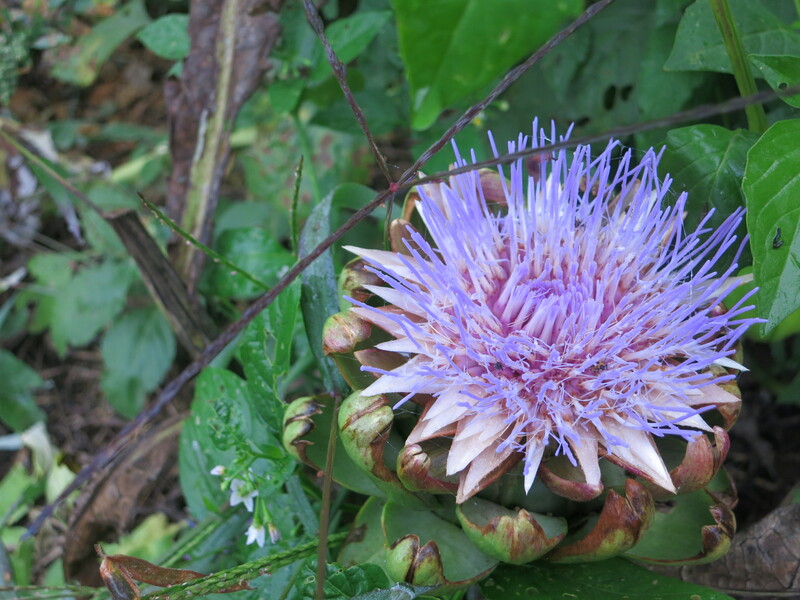 Who knew that the artichokes would keep popping out the chokes? And then bursting them into bloom! Squash, sweet peppers, kale, Seckel pears, plums. The squash has all been harvested now. This week the choices are Small Wonder spaghetti squash, which has flesh that comes out in strings like spaghetti, and Black Futsu, a delicious golden fleshed squash with hints of hazelnut. 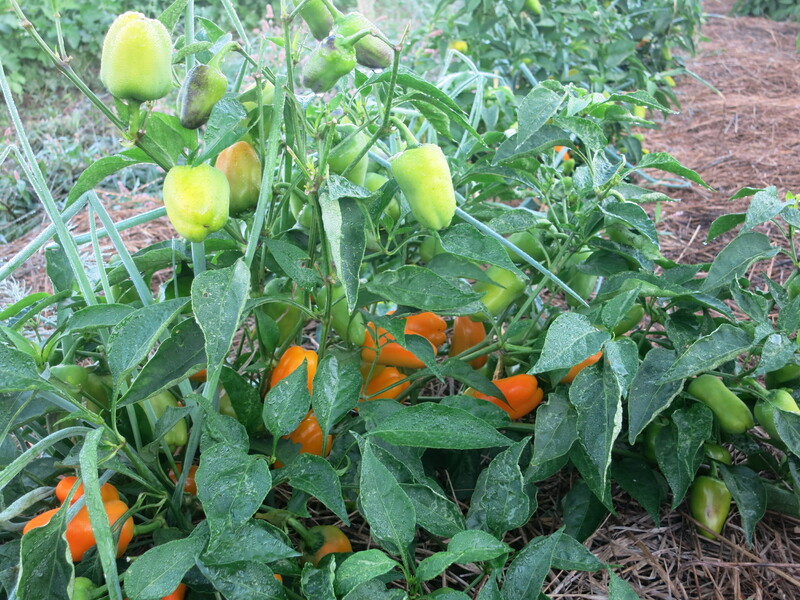 The warm fall weather of this past week has been great for keeping the sweet peppers going. They are continuing to ripen and taste great! Another bunch of kale is part of your CSA share this week. Use it in fresh in salads and smoothies, or stir fry or saute it, add it to soups, stews … Not only does it taste good, but it’s super healthy too! 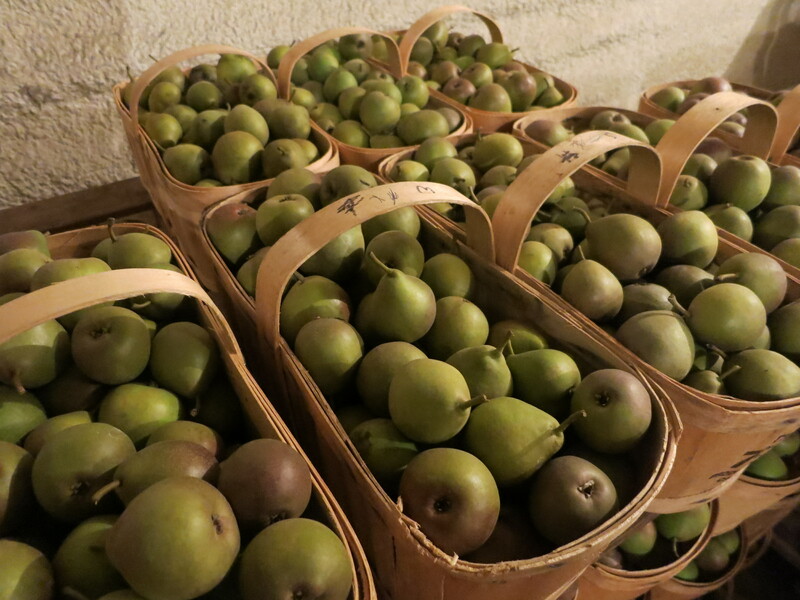 Seckel pears – those little, crunchy pears are back for an encore. Many of you have asked for them again in the box. The blue Italian plums are almost finished. This is probably the last week they will appear in your share. While most are eaten fresh, a CSA member suggested cutting them in half, sprinkling them with a bit of brown sugar and roasting them in the oven. Or how about plum butter? Here’s the link to this favourite recipe from another member – www.nutmegnanny.com/2011/08/24/spiced-plum-butter. More hot peppers are available to those who want them. Next week will be the final week for CSA 2014. 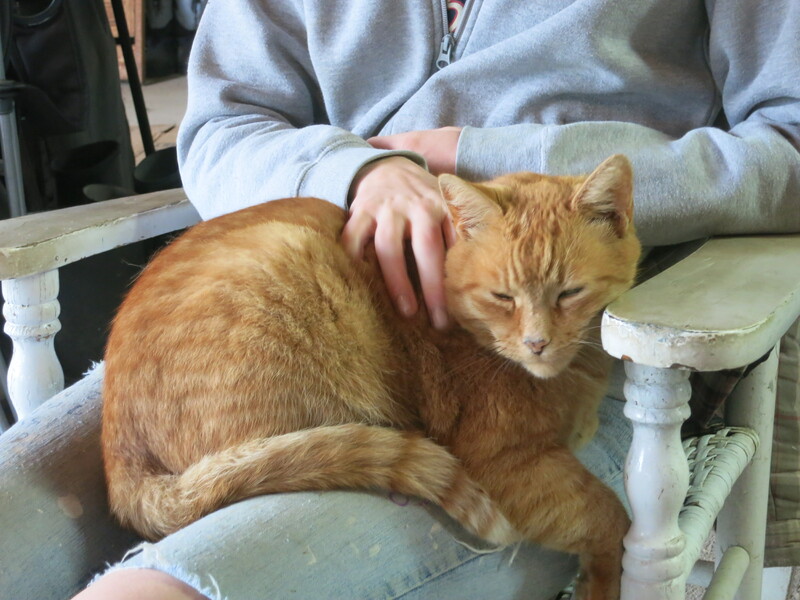 Ollie already has his feet up and is relaxing – and trying to keep others from working too! Chinese cabbage, Italian plums, Bartlett pears, onions, garlic, sweet peppers. 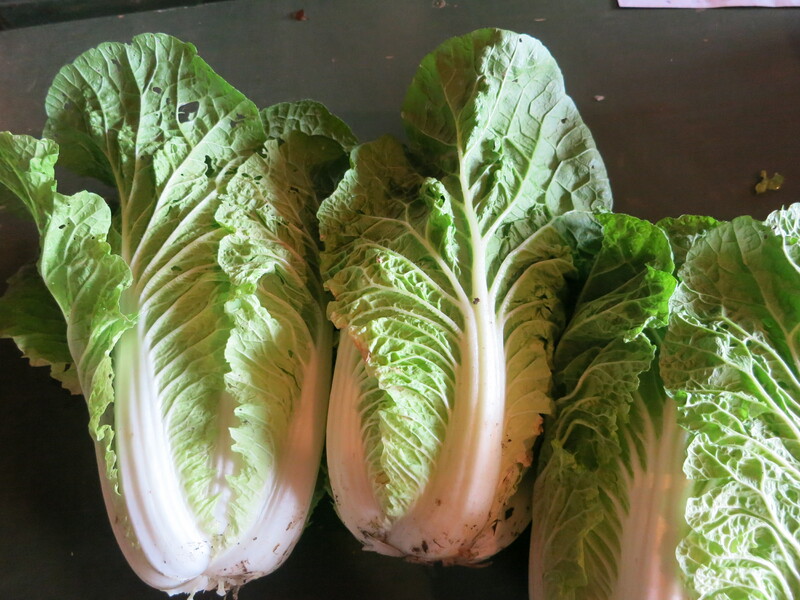 Chinese cabbage is a very beautiful plant with an amazing bright green colour. 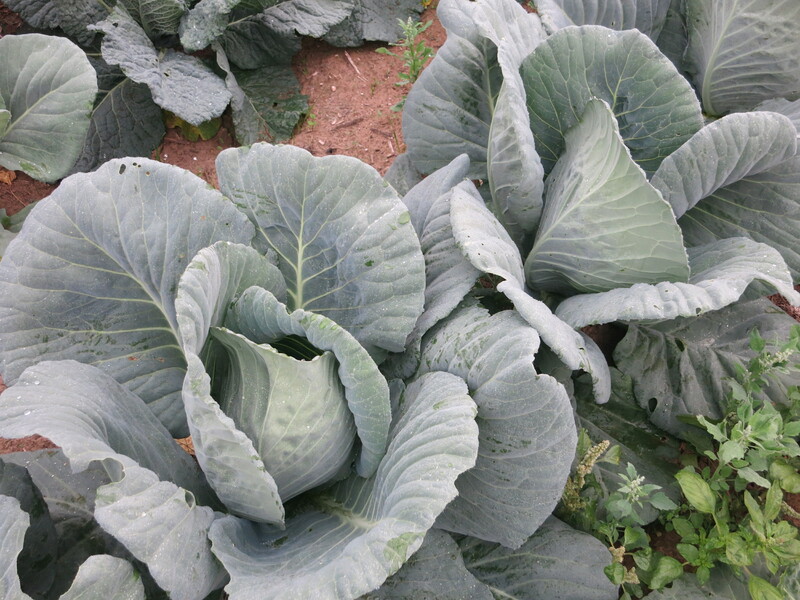 It is much more tender than our usual cabbage, with a milder flavour. Chinese cabbage or napa cabbage is as much about texture as taste. 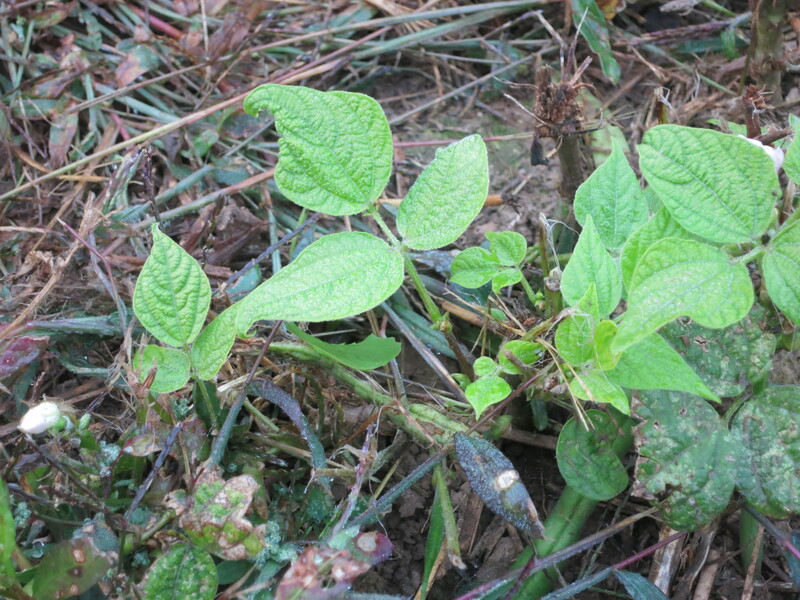 The entire plant can be eaten – the leaves as well as the white ribs. Used raw the leaves can replace lettuce in a salad. The ribs can be sliced or coarsely shredded for coleslaw. It is great stir fried on it’s own or with other vegetables, or mixed in fried rice. Toss the ribs in hot oil for about 2 minutes; add a bit of broth to soften, then add the leaves and toss another minute or so. Another use is in soups or stews. 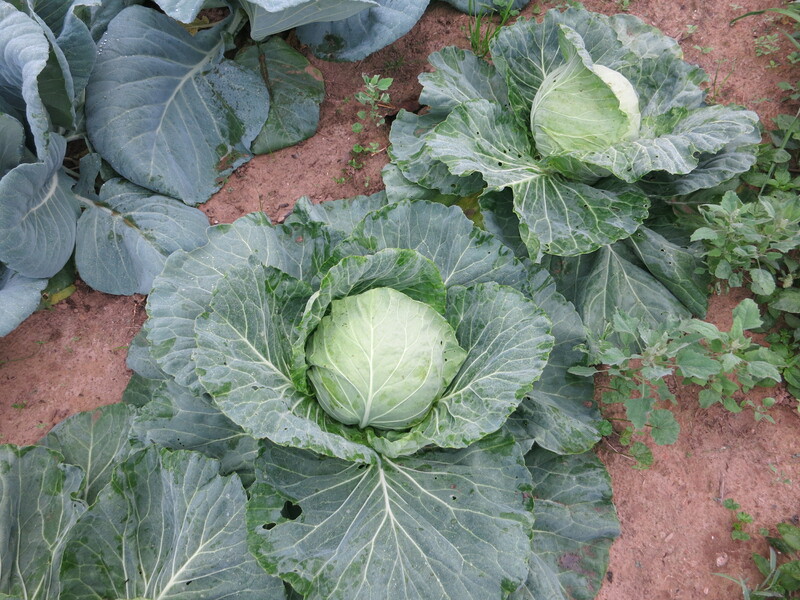 But unlike our western cabbage, chinese cabbage does not store for a long time. Keep it in the fridge wrapped in plastic for about 2 weeks max. Italian plums/prunes are part of your share again this week – maybe next week yet too. Besides eating fresh, they are great in baking & jam… They also freeze well. Simply slice in half, take out the pit & freeze overnight on a baking sheet. Bag them up the next day. In winter they taste great – eat as a snack, or add to fruit salads. There is another basket of Bartlett pears in the box this week. Remember that Bartletts can be used for many things (see suggestions in last week’s newsletter) including pear sauce. Make it and eat it just like apple sauce! This may finally be the end of the onions! 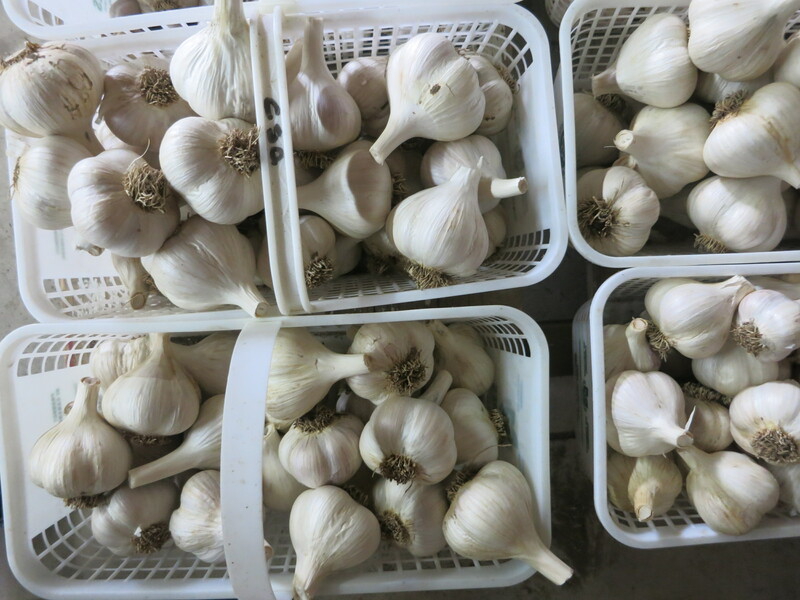 We are getting lots of positive comments on the garlic – we agree, the taste is incredible! Some of you have asked about buying quantities for winter use. We’re still cleaning garlic. Once that job is done, we’ll count out what we need to save for seed for planting later this fall, decide how much we need for our CSA baskets, and then we’ll see what is available to sell. 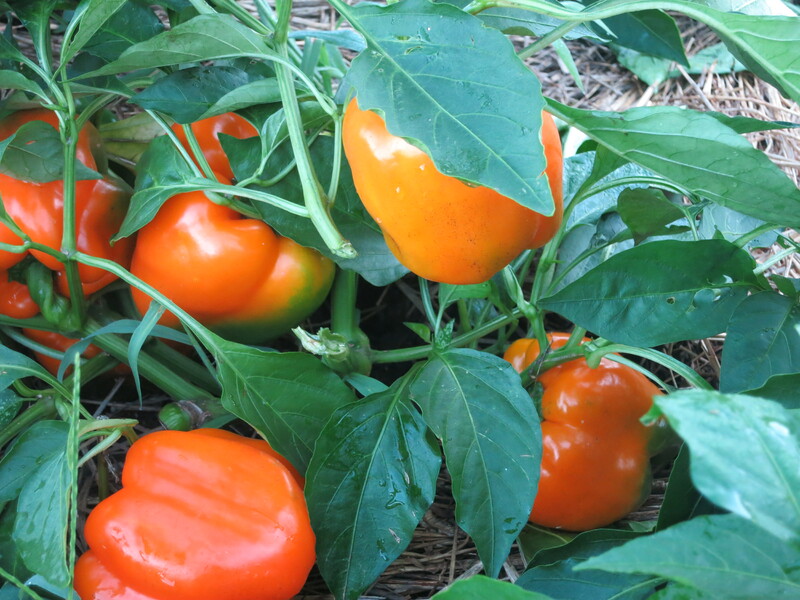 The sweet peppers continue to produce & produce … We are relieved that the cold temperatures of last week did not damage them. 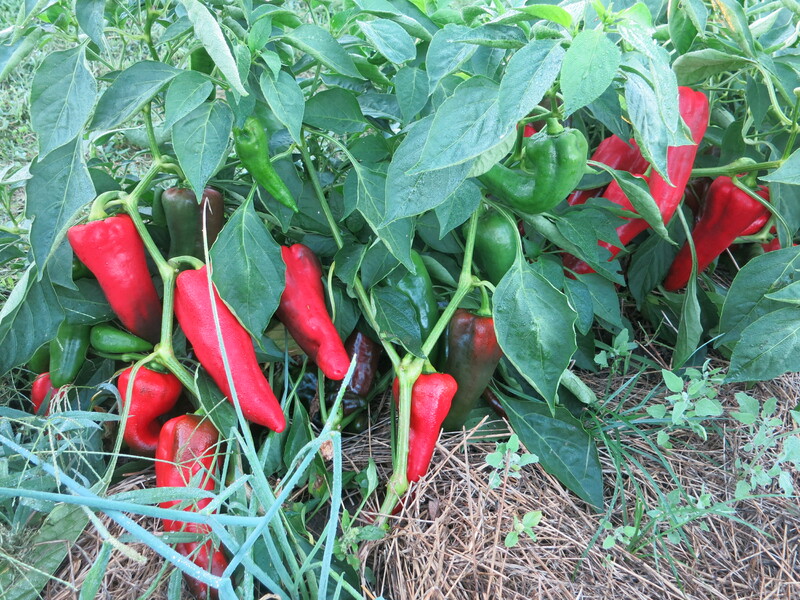 The hot peppers are also producing an abundance of fruit. 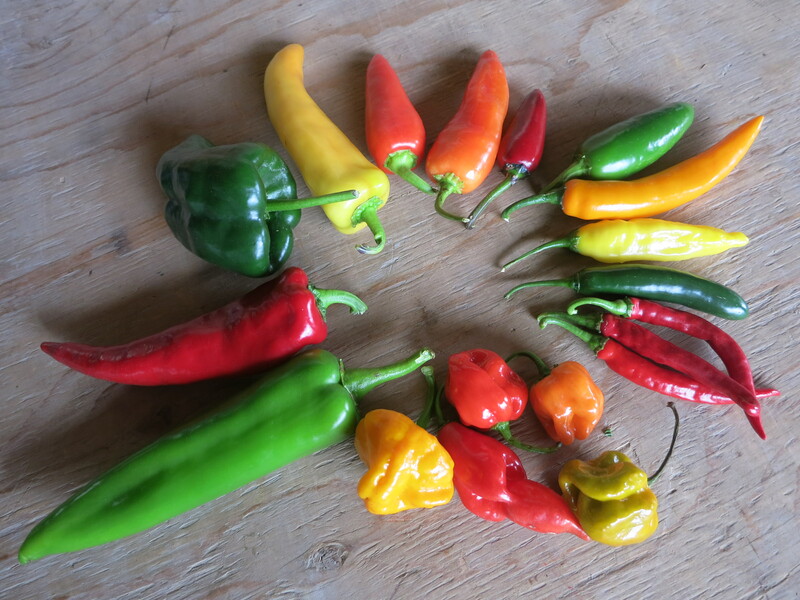 We are offering hot peppers as an extra to those who want to add some spice to their life! There will be a few varieties available in varying amounts of heat. Some of the hot peppers we are growing this season. Starting in the bottom, left hand corner & moving clockwise they are: Anaheim Joe E Parker, Crimson Hot, Poblano, Hungarian hot wax, 2 kinds of chiles – Santa Fe Grande & Chile D’arbol, Black Hungarian, Jalapeno, Golden Hot, Lemon Drop, Hot Rod Serrano, Ring of Fire Cayenne, 4 varieties of Habanero and Scotch Bonnet. This same order is also mildest to hottest. Not shown are Ghost & Trinidad Scorpion – these 2 super hot peppers are still ripening. 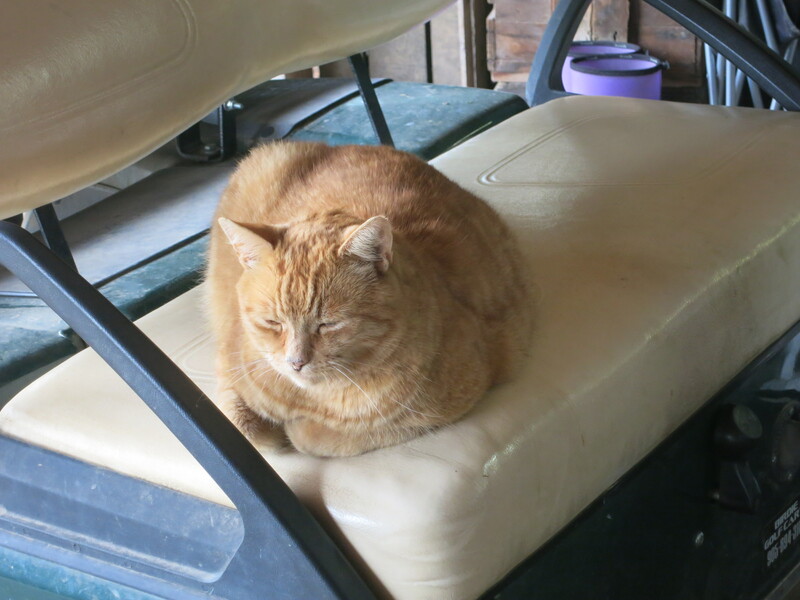 Oliver – not at all interested in hot peppers … or anything other than resting! I ate a pear the other day. Actually that’s a big deal for me because I don’t much like pears. I probably eat more peaches in 1 day than I do pears all season. We’ve always grown pears. Our oldest pear trees were planted by my father back in 1953. Many of them are still producing good fruit. Pear trees can last a long time! Our “new” pear orchard was set out in 1999. The plan was to remove the old trees when these young ones came into production, but we’ve kept them all since they are still bearing good fruit. Now that my father is gone, we perhaps keep them for sentimental reasons – they are some of the last trees left on the farm (along with a few cherries) that he planted. Here at Thiessen Farms we grow 9 varieties of pears. Harvest begins in late August and runs through the middle of September. Harrow Delight & Harvest Queen are picked first. They are small pears, best eaten when still crunchy. The little Seckel pears come next. Seckels are tiny, crunchy & sweet. They never will get really soft. Best used for eating, they can also be poached or pickled. Because of their size, Seckels are perfect for kids lunches. 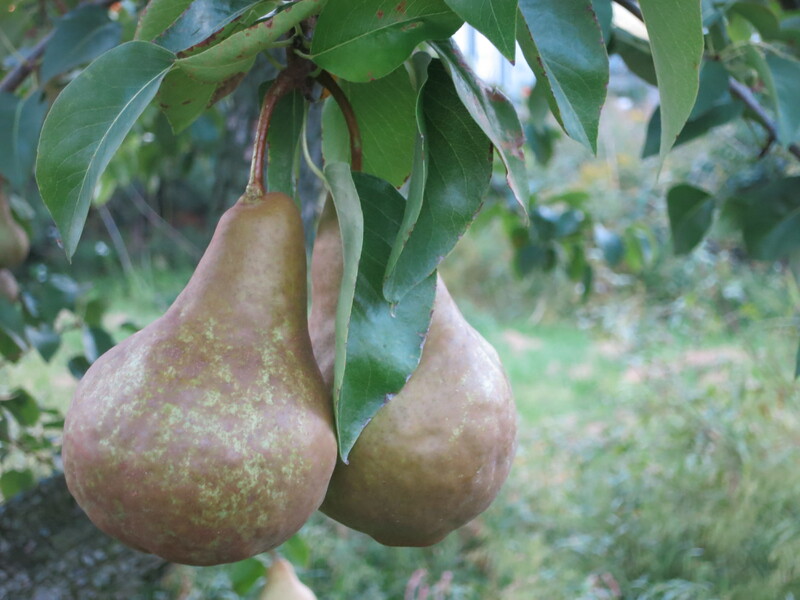 Flemish Beauty – a flat, squat pear & certainly the most delicious pear (even I almost like these)! We only have a few trees – wish we had a lot more. We picked our Bosc pears today. They are a long, russeted, almost brown coloured pear. They ripen to a golden brown & get extremely sweet. Sometimes they are known as Christmas pears because they can easily store till Christmas or longer if kept refrigerated. Bosc can also be canned, poached, and used for cooking. Harrow Sweet finish the main pear season, and are another variety that is best eaten while still a bit crunchy. 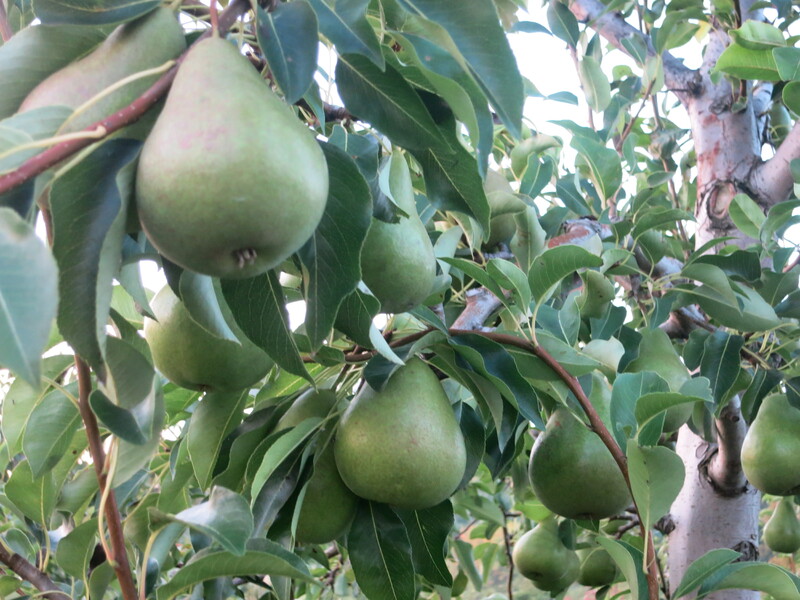 Asian pears (we only have about a dozen trees ) are harvested in late September. We have a yellow variety & a brown kind, but I don’t know their actual names. They look like an apple but have a light, juicy texture with incredible sweetness. 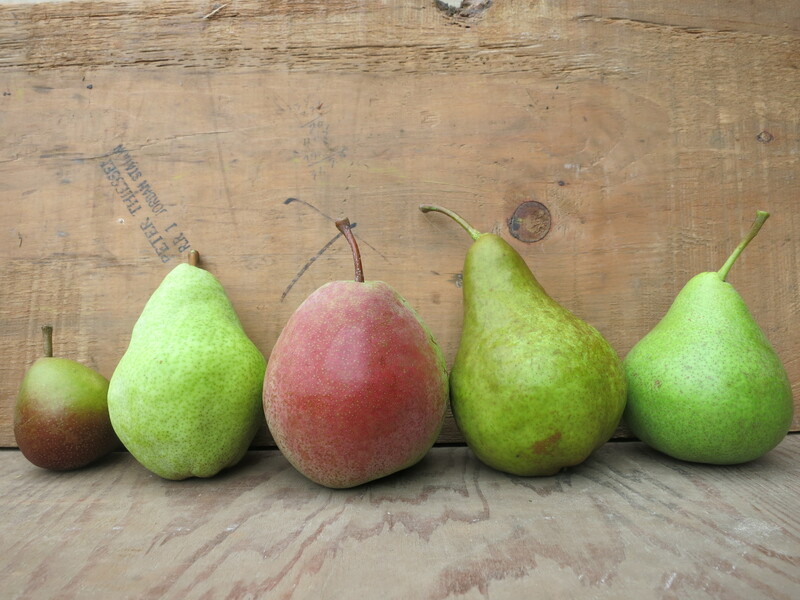 All these pears are sold at our farmers’ markets. 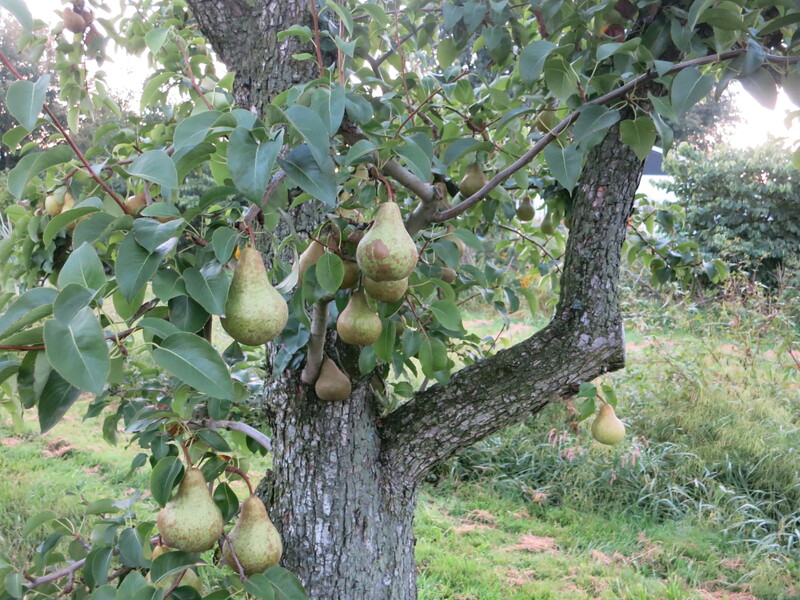 However, most of our pears had a light crop this season so there won’t be as many as usual. The Bartlett, Bosc & Seckel can also be found in our CSA boxes. (from left to right) Seckel, Bartlett, Flemish Beauty, Bosc and Harrow Sweet. Italian plums, Bartlett pears, Seckel pears, kale, sweet peppers, onions & garlic. Italians plums are an old favourite variety (and the only kind that had a crop for us this season). Great for eating, baking, jam … these freestone plums get quite sweet as they soften. 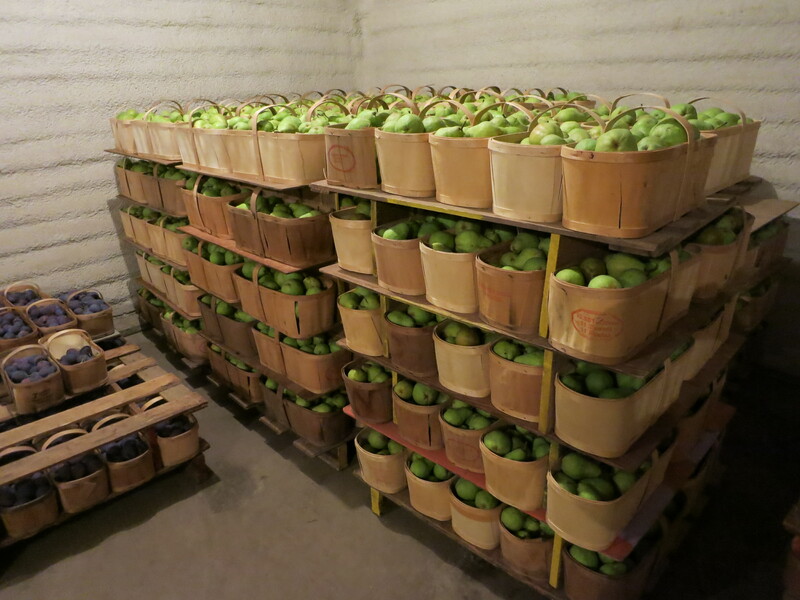 Bartlett pears & Seckel are included in this week’s box. See descriptions & possible uses above. 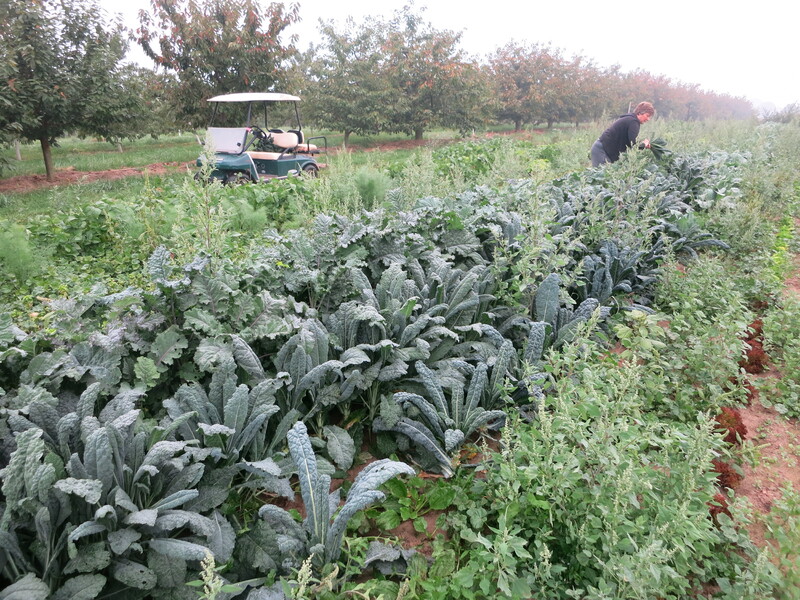 The kale is thriving in this cooler weather! 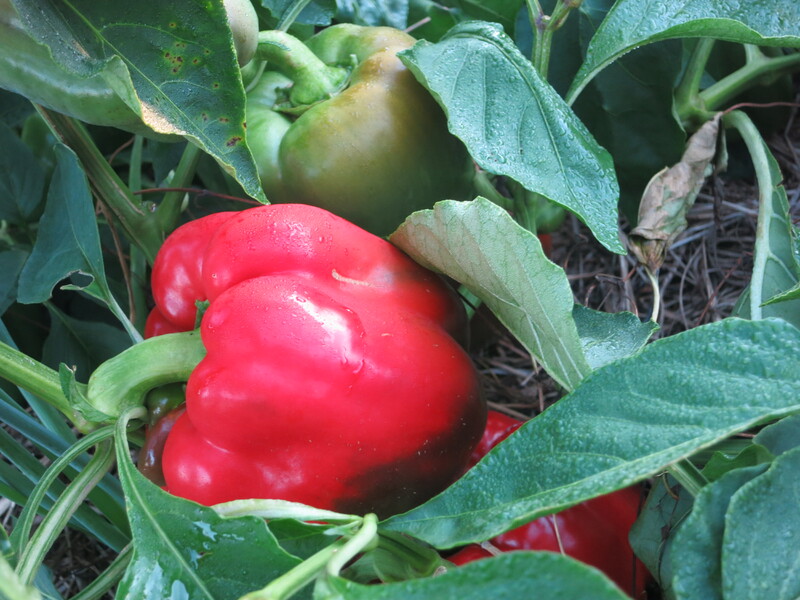 It’s a great season for sweet peppers! If you’re not keeping up with eating them, store in a plastic bag in the fridge – they keep for several weeks. Or chop them up & put in the freezer. They are great in soups, casseroles and sauces this coming winter. Our Ailsa Craig onions are the onions that never end, but everyone seems to be enjoying them still. Remember to store garlic in a dry & cool place (it should keep until late winter, or even spring). We are winding down on the peaches (only 2 varieties left to pick), blackberries & tomatoes – the fruits of summer. 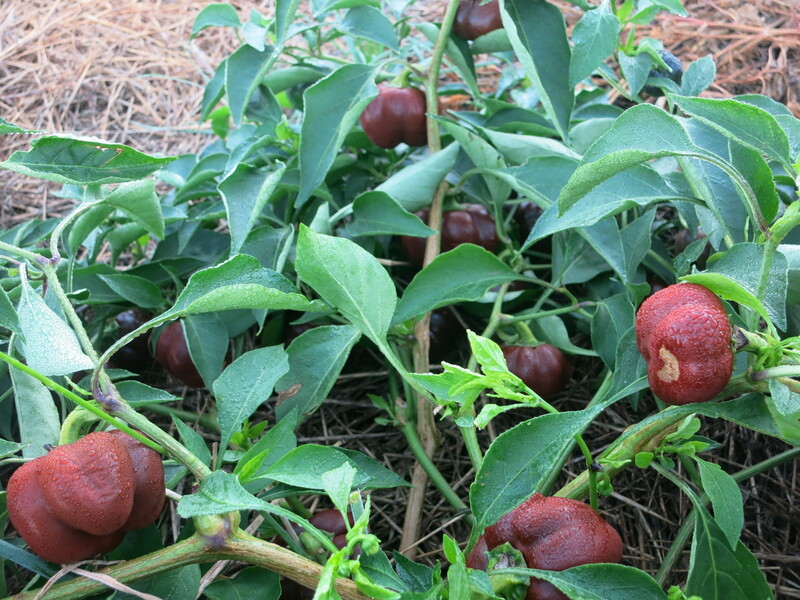 But our fall crops, including pears, plums, and peppers are coming on strong now. 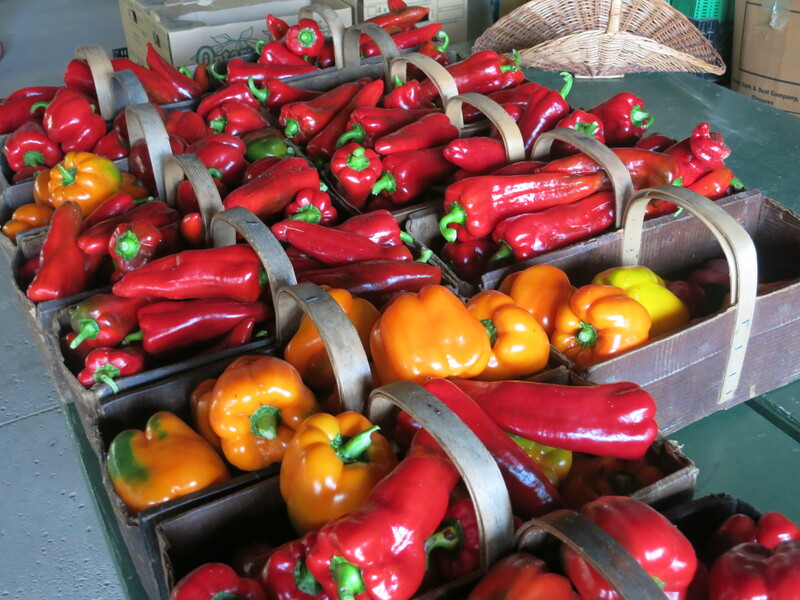 Peppers – both sweet & hot, large & small, and in many different colours – were picked today. 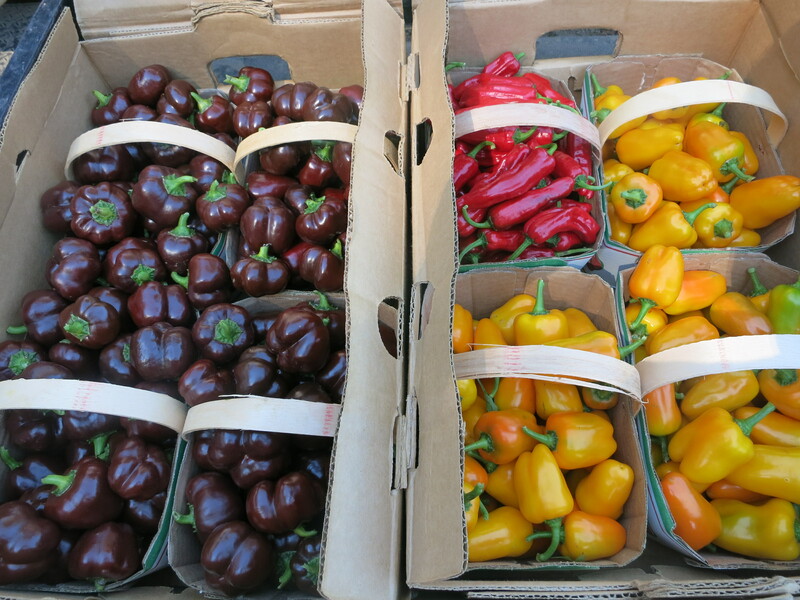 Look for these beautiful red, yellow, orange & purple peppers in this week’s CSA box. These mini chocolate bells, sweet yellow stuffing peppers, & Italian pepperoncini will be available at our farmers’ markets. They turned out so well, and are becoming so popular that we will be growing them for CSA next year as well. 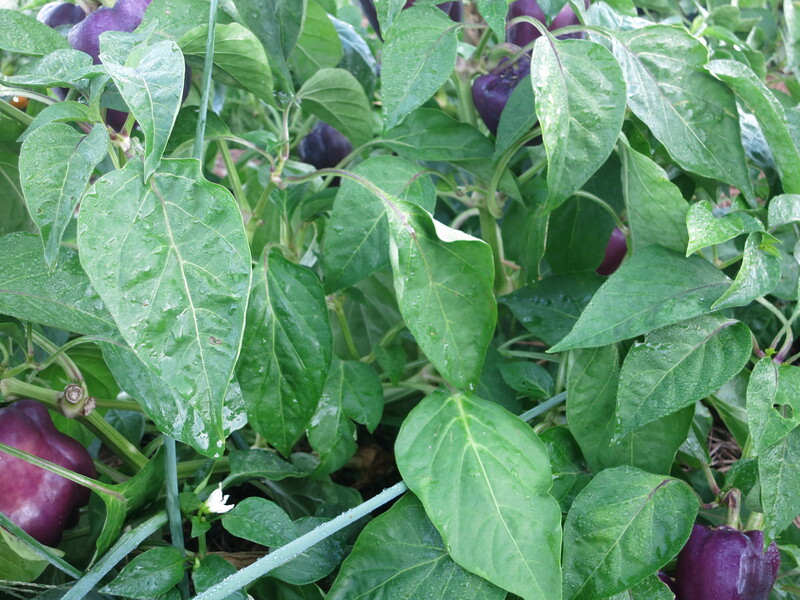 Bartlett pears, green beans, sweet peppers, collard greens, garlic, onions, lettuce (Tues. only). This week the fruit portion of your CSA share moves from peaches to Bartlett pears. Bartletts can be eaten green & crunchy, or allowed to ripen more until they are yellow & soft. Keep them in the fridge if you prefer them green. At room temperature they will ripen quite quickly – so watch them carefully. They are great for eating, as well as cooking, baking, canning & jam. 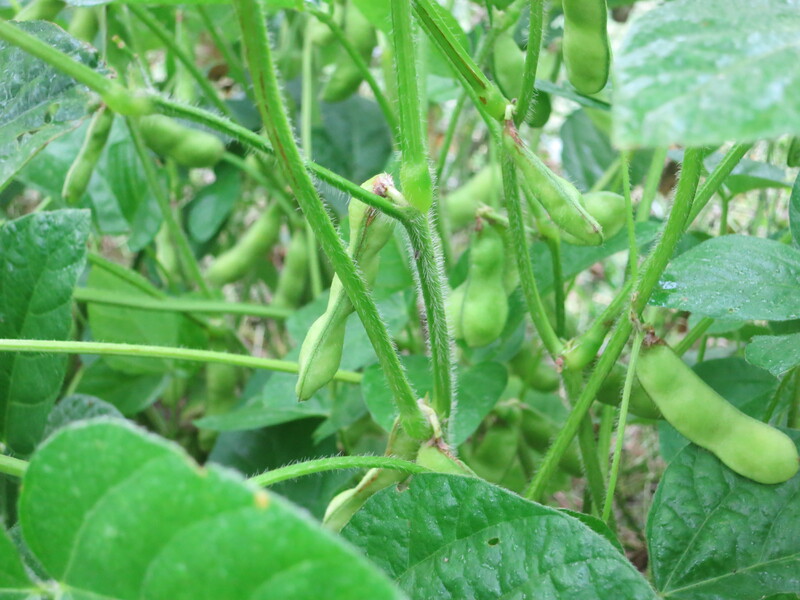 Our final planting of green beans has matured and is in your box this week. Sweet peppers are coming on strong now, as described above. 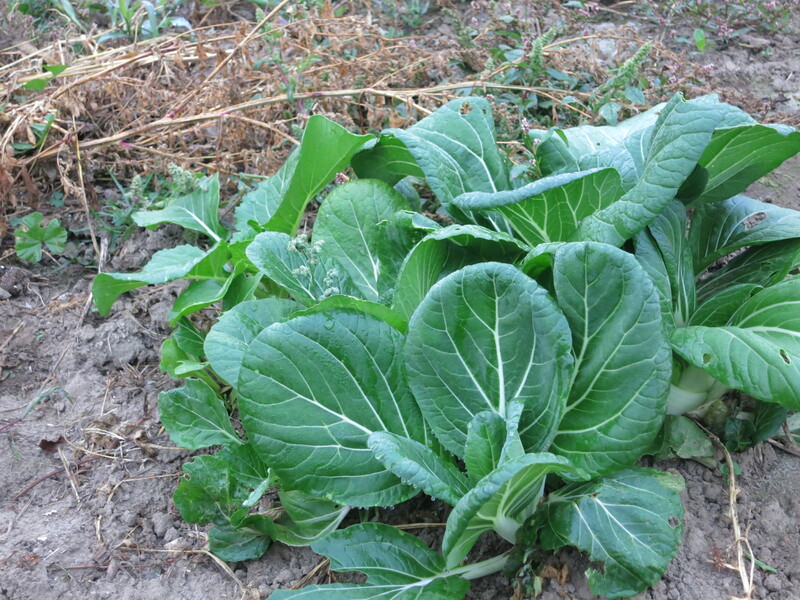 We received many favourable comments on the collard greens the other week. Another bunch is included in your share this week. Garlic & onions continue. Remember not to store garlic in the fridge – keep it in a cool, dry place. 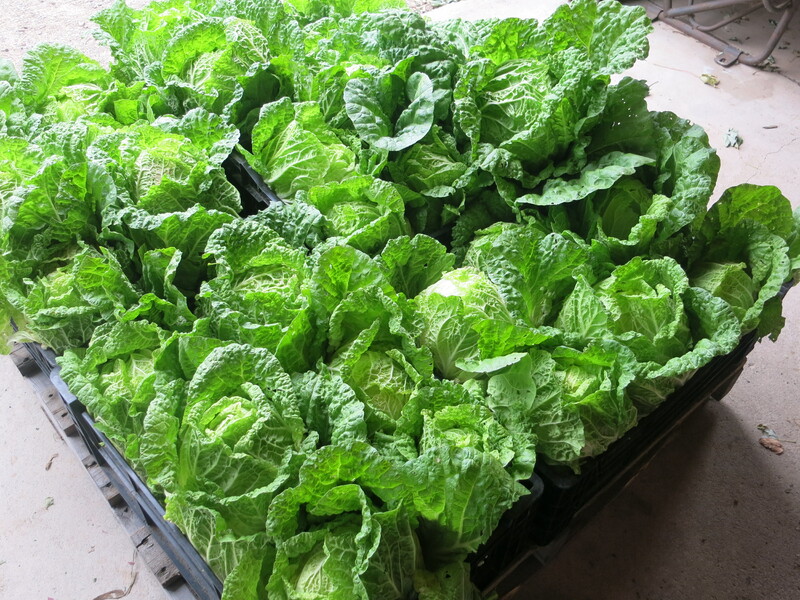 There is enough lettuce left for Tuesday’s box only. Sorry to those who pick up on Friday! This is week 15 of our CSA. Only 5 more weeks are remaining. This season we grew fava beans for the first time. Customers said they were very good – but we never tasted them. 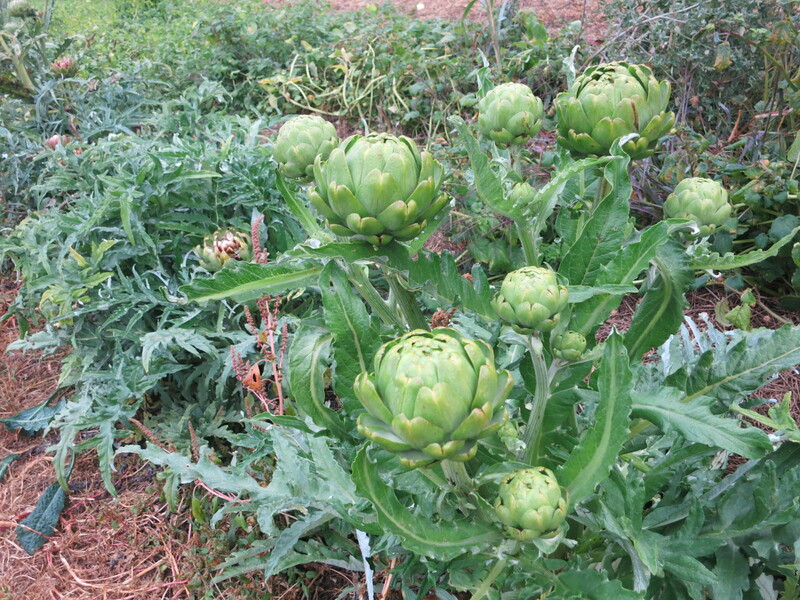 Artichokes were also new this year. We received good feedback from our customers, along with many recipe suggestions – but we’ve tried none of them. 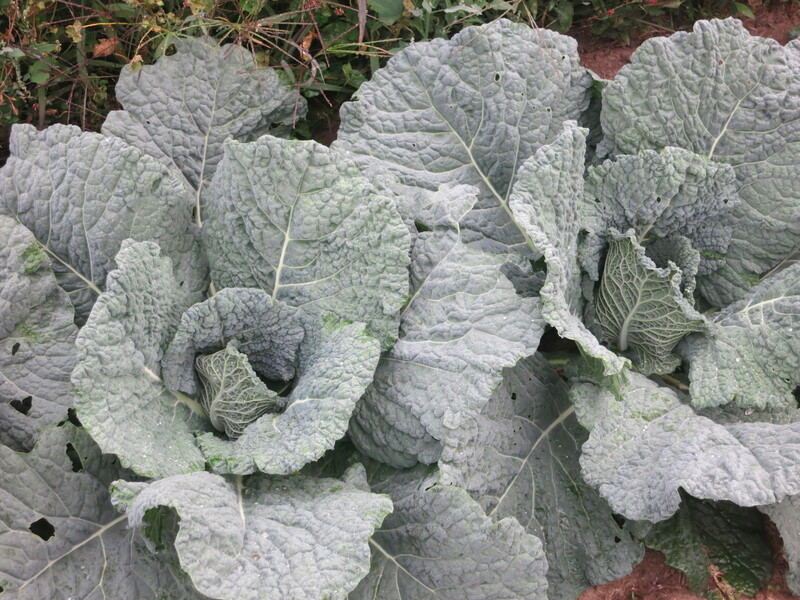 Our first ever collard greens were part of our CSA box last week – but so far, none have made it into our kitchen. Last year, it was fennel bulbs & tomatilloes. We were told how good they tasted – but we did not experience them ourselves. It’s sad but true. We grow all this great food – vegetables, herbs, berries and fruit – but don’t always eat it. It’s not that we are fussy or picky. Farming takes most of our energy. There just isn’t time to prepare a lot of new foods or detailed recipes. Of course we’re eating fresh all day long. Peaches, blackberries, tomatoes … anything that can be eaten raw, without preparation or cooking is fair game. Quick & simple dishes also appear on our menu – kale & broccoli salad, zucchini, eggplant, or peaches on the grill, fresh tomato sauce over pasta … It’s a wonderful time to be eating from the farm! This recipe was given to us by a customer at market. It originally comes from U of T student Lauren Classen. It is a chunky, savoury/sweet jam. Lauren spooned it into whole wheat tarts and won 1st place in the Feast of Fields appetizer contest. Spread this jam on baguette slices with Ontario goat/sheep cheese, or on sliders or mini pizzas. 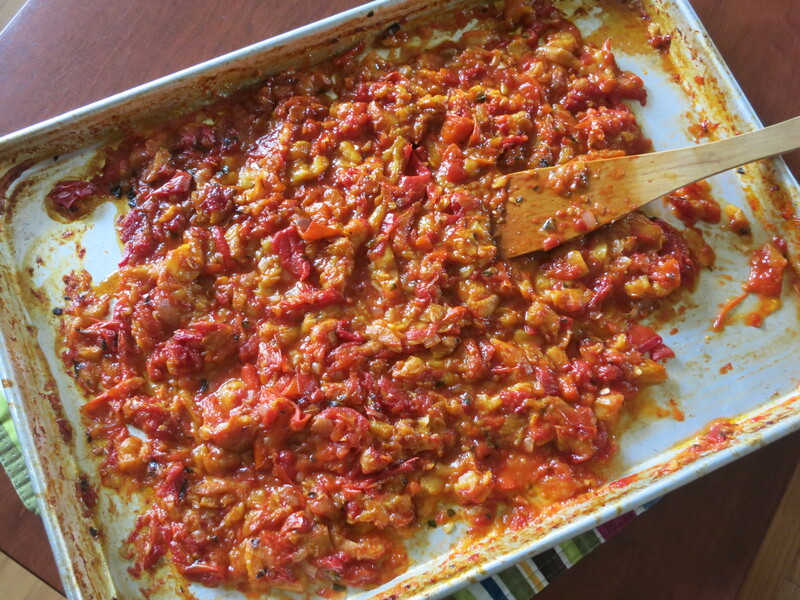 Place tomatoes cut side up, without overlapping, on 1 side of a large rimmed, baking sheet or in a large roasting pan. Pile peaches & onions on the other side. Stick garlic between tomatoes. Sprinkle sugar on just the tomatoes. Drizzle olive oil & sprinkle salt & oregano over everything. Roast in a preheated oven at 400F (200C) for 40 minutes; onions & peaches will start to brown on edges. Smash tomatoes with a spatula to release juices. Mix everything together. Bake, stirring every 15 min. until tomatoes are dark, moisture has evaporated, and mixture is consistency of thick jam, about 1 hour. Taste & adjust salt or sugar. Serve warm or cold. Refrigerate in sealed container up to 1 week or freeze. 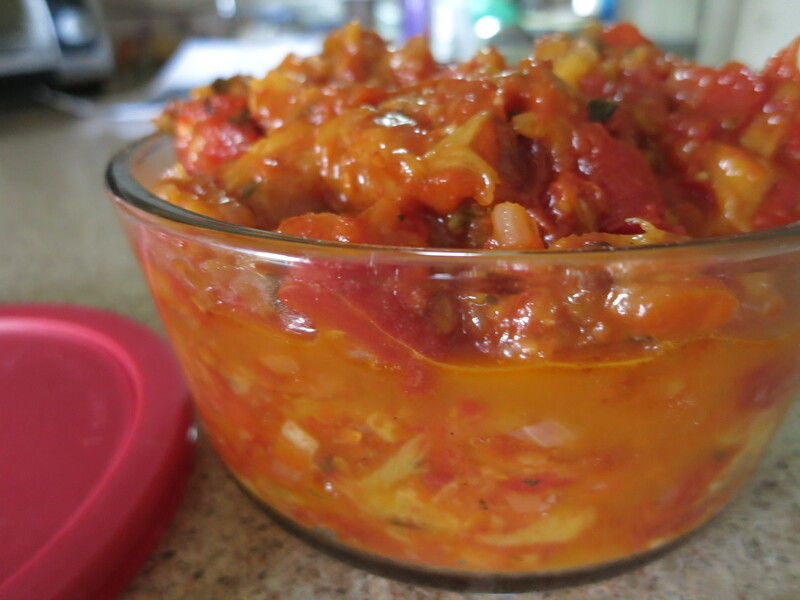 ** We probably roasted this jam for closer to 2 hours – our tomatoes are so juicy this year, they take longer to thicken. Increase the peaches for a sweeter jam. It is more savoury than sweet with the given proportions. We also cut down on the amount of garlic, and added some black pepper which the recipe did not call for. Here’s another recipe, recommended by one of our CSA members. She claims to not be a bread baker, but loved this loaf – called it the best bread she’s ever made! Combine the flour and salt in the bowl of a standing mixer. Make a well in the middle of the flour and pour in the tomatoes, the water/yeast mixture and the herbs. Stir with a wooden spoon or wooden spatula just until the ingredients are starting to come together, then attach a dough hook to the standing mixer and knead the dough for about 8 minutes on medium (“2” on a Kitchenaid standing mixer). The dough will still be a little sticky and tacky. If it’s too wet, add a little more flour. Remove the dough from the bowl and roll into a ball. Garlic, lettuce, peaches, blackberries, onions, tomatoes, sweet peppers. Our crop of garlic is finally dried & ready to go. Use it with caution – the flavour is incredible! Lettuce is back in your share this week. It has grown well & tastes great. Peaches are quickly coming to an end. There are only a couple more varieties to be picked. Enjoy them while they last. Another taste of blackberries is in your share this week. Last year’s CSA members remember how many blackberries they would get in their box each week. This year’s crop is much smaller because the plants were damaged by the harsh winter, and so there are fewer in your share. Onions, tomatoes, and sweet peppers continue to produce, and are part of the box again. 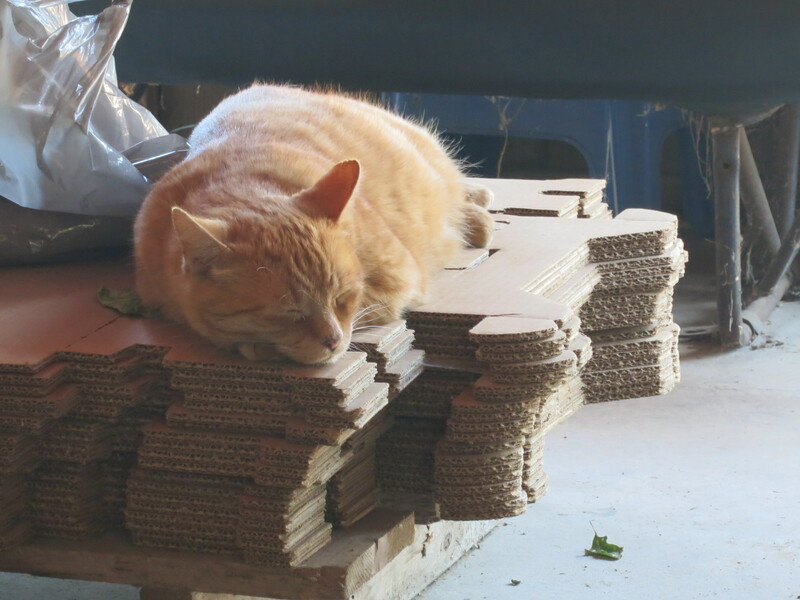 Oliver, getting into the spirit of Labour Day!